The same way a conductor is nothing without his orchestra, a farmer is nothing without his soil... but together, each pairing can make something magnificent. To tell our story, we first have to introduce our orchestra: The farm. Without it, we'd just be up here in coattails waving our arms in silence. 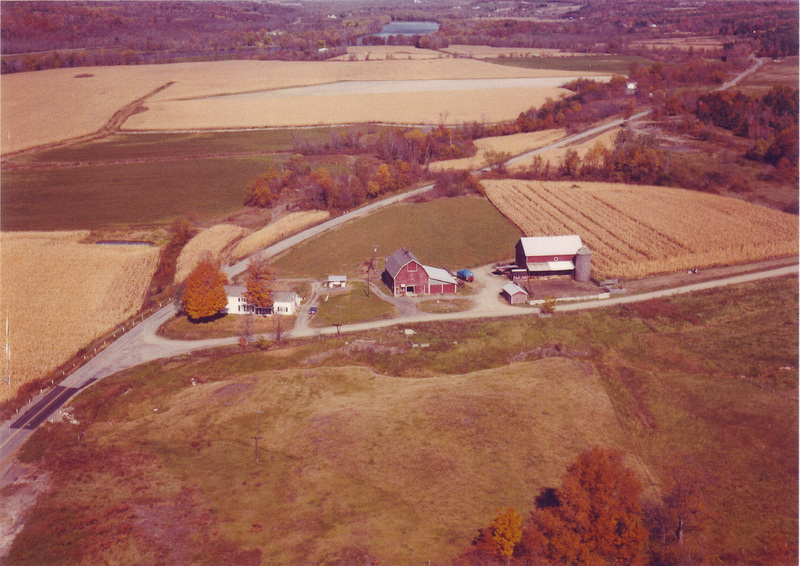 The land we farm was part of a large tract of land that was "purchased" from the Mohawks in 1684, though it wasn't confirmed by the colonial government until 1708 in the Warrant for Saratoga Patent. 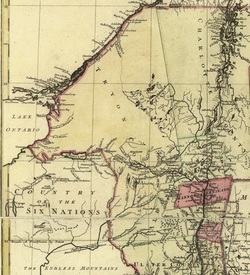 This huge tract of land, encompassing nearly all of New York state north of Albany plus a good portion of present-day Vermont, was further subdivided in 1701 to create Rensselaer and Saratoga counties, and again in 1772 to create Tryon (Montgomery) and Charlotte (Washington) counties. In this second subdivision, our property (along with tens of thousands of acres) was sold to William and Robert Bayard of New York City. Easton Quaker Meeting, still standing today 7 miles east of our farm. Claude Sauthier's map of Tryon and Charlotte (Washington) counties, 1777. When the Bayards bought the land, few settlements existed in the area between Peter Schuyler's "Fort Saratoga" (in present-day Schuylerville) and the village of Stillwater, itself a tiny outpost. The river's many rapids and falls made boat traffic impossible, so the region remained largely wilderness. In 1773, several Rhode Island Quakers, fleeing what became the Revolutionary War, settled in Easton. At the time, the settlement was at the very eastern edge of Saratoga County--hence the name. Other Quakers soon followed from New York City, Westchester County, and Dutchess County. A year later, in 1774, a Dutchess County Quaker named Job Wright bought our land from the Bayards. Job was a Captain in the Revolutionary War, and likely came to know the area and its inhabitants while serving under Colonel Jaacob van Shack in Albany. In 1790, Job sold the farm to his son Abraham for 532 pounds and 15 shillings. 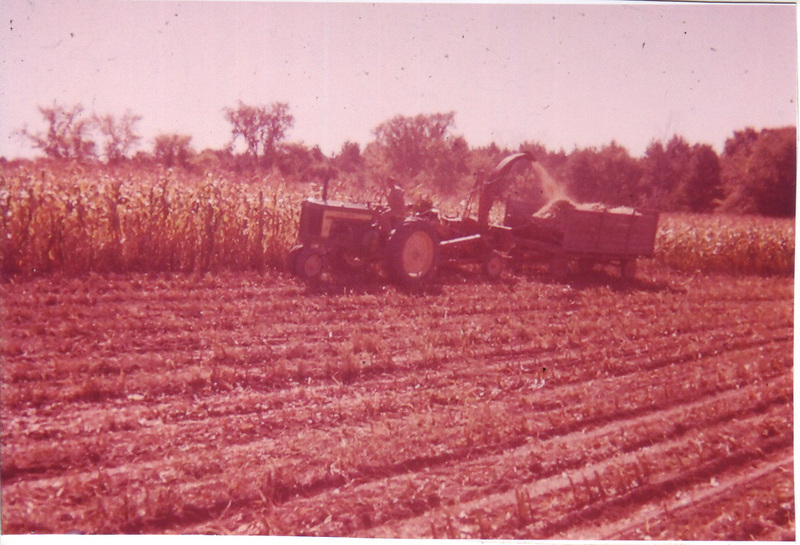 The Wright family continued to live and farm here through the generations, raising crops on the fertile bottomlands and grazing animals in the upland pastures. When the Champlain Canal was dug alongside the Hudson in 1824, the area experienced a surge of growth. Wilbur's Basin, just north of our farm and across the river, became a major trading hub and stopping point. Abraham Wright and his son, John, ran a grocery store and ferry on the river: "Wright's Ferry" ran from the end of Wright's Road--which then extended to the river--to Wright's Loop, a road on the far side of the river that still exists today. 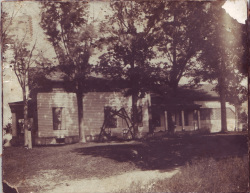 Our home, viewed from the south, date unknown. The dirt path in the foreground is Wrights 'Road'. 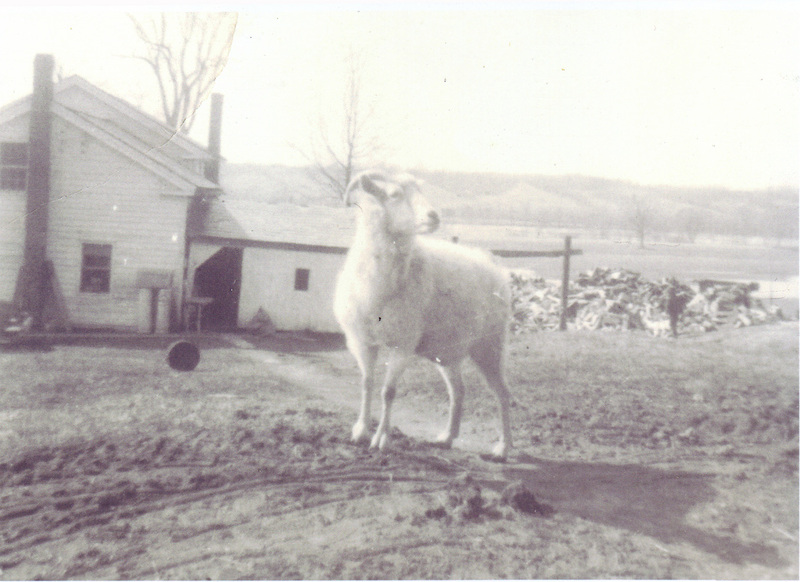 Gil Wright's pet goat in the 1930s(? ), with our house and lower flats in the background. Notice the large pile of hand-split wood near the woodshed--coal heat didn't arrive until years later. In 1814, the original farmhouse was moved 50 feet to the north and rebuilt with a "modern" addition where it stands today. Under the floor you can still see the hand-dug cistern that supplied water for the household. The entire house is built with wood cut from the property, and the slate roof was likely quarried in nearby Granville. Our current peg-built, slate-roofed barn was built in 1914 after two previous barns burnt down on the spot--one from a hay fire, and the second just a year later from a lightning strike. The Wrights passed their farm down through the generations, building a thriving small dairy. The barn, once used to house work horses and grain, was used as a calf barn. Ice was cut from the river, stored in the icehouse, and used to chill the milk until it was picked up. Electricity--and indoor plumbing--didn't reach the farm until after World War II. Prior to that it was an outhouse and a deep well sunk in the basement. Cutting corn on the flats with a 195? John Deere. 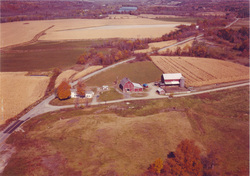 Our farm in the 1970's. The large cow barn and silo on the right came down years ago. Our greenhouse stands there now. Gordon Wright was the last of the family to run the farm as an active dairy. 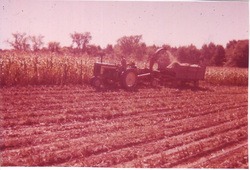 He ran the farm with his wife, Marguerite, from before World War II until he retired in 1972. Gordon then worked for the Washington County Fair, as he and Marguerite continued to live in the farmhouse through the 1990's. Another farmer ran the property as a dairy, and when he moved on, the fields were leased to a neighboring dairy. When Gordon and Marguerite passed away, the family was faced with the difficult decision to sell the farm... Meanwhile, we were searching for land to start a vegetable farm.